Scholars of critical tourism studies know well that tourism does not merely reflect broader economic and cultural changes; as the world's single largest international trade, tourism is instrumental in shaping much of economic and cultural life. We can therefore look to the shifting practices of tourism to see how it is responding to the changing demands and desires of global capital but also how tourism is leading the way - reinventing not only itself but also recreating new forms of economic and intercultural exchange. While eco-tourism and adventure tourism may be more and more popular, arguably the fastest growing mode of contemporary tourism is that of "luxury travel" - for evidence, there's the International Travel Market and the annual Luxury Travel Fair. This is a big-bucks market in search of the big-buck earners. Global power, once governed by the (false) logic of European/British colonialism now follows the lead of the more transnational but no less concentrated (false) logic of post-industrial, service-based economics. 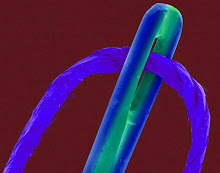 The two regimes are not worlds apart, however. On the surface, things have changed; look beneath the surface and the world order is little changed. The chief benefiters haven't even left the building! The Straits Club is The Fullerton Hotel Singapore's premier executive club. Offering personalised service and a private check-in experience, The Straits Club, whose privileges can be enjoyed at an additional premium, pampers its guests with luxurious amenities and thoughtful service. 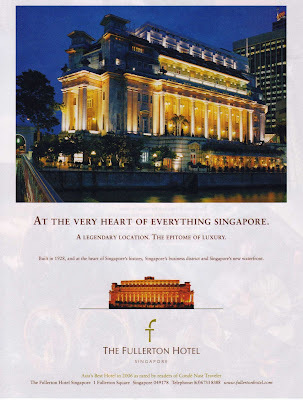 Guests staying in any of the suites at The Fullerton Hotel Singapore are also entitled to The Straits Club privileges. Has no-one told them that the sun did actually set on that empire? Well, sort of.